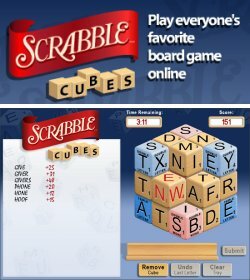 SCRABBLE Cubes is a new game from WorldWinner, and has quickly become one of the most popular games on the site. SCRABBLE Cubes is a 3-D word game based on Hasbro’s classic crossword board game, in which players achieve high scores by connecting letters to find as many words as possible across the surface of an ever-changing arrangement of cubes. The game features SCRABBLE tiles with corresponding point values, giving wordsmiths everywhere the opportunity to compete in a modern version of their favorite word game for cash and prizes. Adding to the challenge, players are tempted with bonus cubes containing special values, such as “double word score” or “double letter score,” as in the popular SCRABBLE board game. The games plays as sort of a three-dimensional Boggle, except that it uses SCRABBLE point values and bonuses. This is not just a straight conversion of SCRABBLE to online play. This is actually a game that could never exist in the real world, but it’s a perfect fit for the computer and online play. You can play for free in practice mode as long as you want, or you can play in one of the many ongoing live competitions against real people from around the world. SCRABBLE Cubes is a terribly addictive new diversion, and should please any word lover. Note: This is an archive post; it was originally published on December 8, 2006.